Our relationship with food can be complex. For decades, Americans have had broad access to an embarrassment of riches on supermarket shelves. And as such we often take that bounty for granted. Scarcely a century ago a bunch of bananas or a pint of strawberries in the middle of winter were rare and exotic treats. Contemporary America not only has a huge range of exotic foods year-round, but we have cable television networks that broadcast nothing but shows about cooking and food. Some offer merely the spectacle of bizarre foods from distant cultures or competitions in which the audience roots for their favorite chefs based on personality, but never having tasted or smelled a morsel of food. Beautifully photographed, glossy magazines offer us features on the farms and vineyards that supply our tables while endless cookbooks offer us everything from easy-to-follow cake recipes to the sous vide, alginate-laden masterpieces of top chefs, their dishes plated intricately like edible Faberge eggs. In truth, an alarming number of Americans eat on the go in their cars, or reheat processed foods at home. Though we’re exposed to arguably more food multiculturalism than any other generation, the vast majority of us tend to eat from the same prosaic revolving menu that is fast and easy if not always especially nutritional. Yet we continue to consume vast quantities of food-related media, perhaps to voyeuristically satisfy our unrealized intentions. Our eyes process the sensual experience of food that our mouths and noses have forgotten. 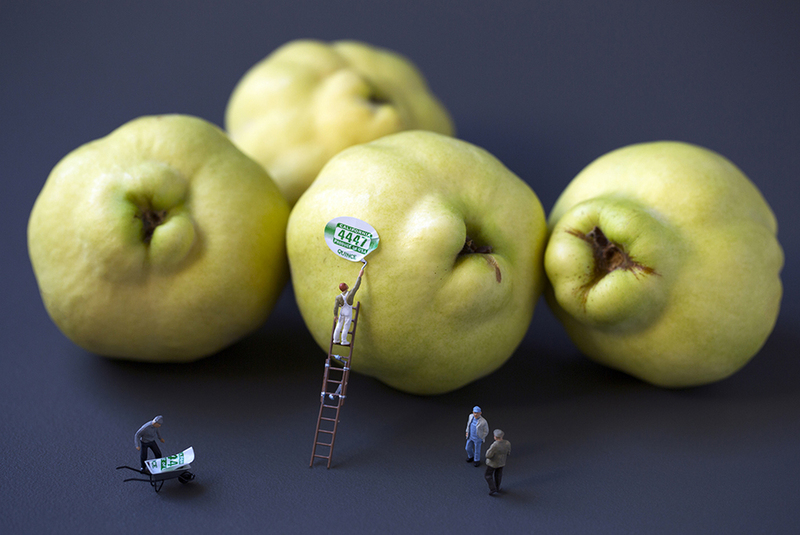 So perhaps it is especially fitting for food to become nothing but an aesthetic backdrop for a world of tiny figures, in the same country that in 2011 produced the five volume Gutenberg Bible of cookbooks: Nathan Myhrvold’s Modernist Cuisine, an $800 reference that a fraction of its buyers will use to actually produce food. The components of the Disparity/Big Appetites photographs – toys and food – are among the most common elements in every culture in the world, regardless of language or socio-economic bracket. So perhaps its accessibility is the basis of its appeal. Playing with the language of size disparity, especially with these two extremely familiar components, seems to draw people into a different world. Usually, the initial reaction to the images in the Big Appetites series is a response to the humor. People imagine the possibilities of standing next to a towering piece of chocolate cake or an Oreo cookie large enough to serve as a raft, floating in a glass of milk. But I hope the deeper effect is to compel the viewer to look more closely at the world around them and to consider deeper truths about our relationship to the food that sustains us but also that we crave for comfort. I’ve heard people see these images and say, “I wish I could live in a world with oversized patisserie.” But the truth is that excess overwhelms us and turns us against what we think we love. Consider an exercise in which we're presented with the scenario of being on a deserted island and having to choose just one of your favorite foods to eat for the rest of your life. In most cases, the thing we would name would be something of which we would tire quickly. Beyond my exposure to and knowledge of the tiny figures from childhood, one of the works that inspired this series was a project called "Travelers" by the brilliant artists Walter Martin & Paloma Muñoz. They used a palette of the same scale figures and created dioramas inside snow globes. Some of the scenes could be whimsical or romantic. But what I especially liked were the darker ones that were fairly disturbing. This work was also influenced by some large dioramas by the Chapman Brothers that I saw at the Saatchi Gallery in London back in 2003. 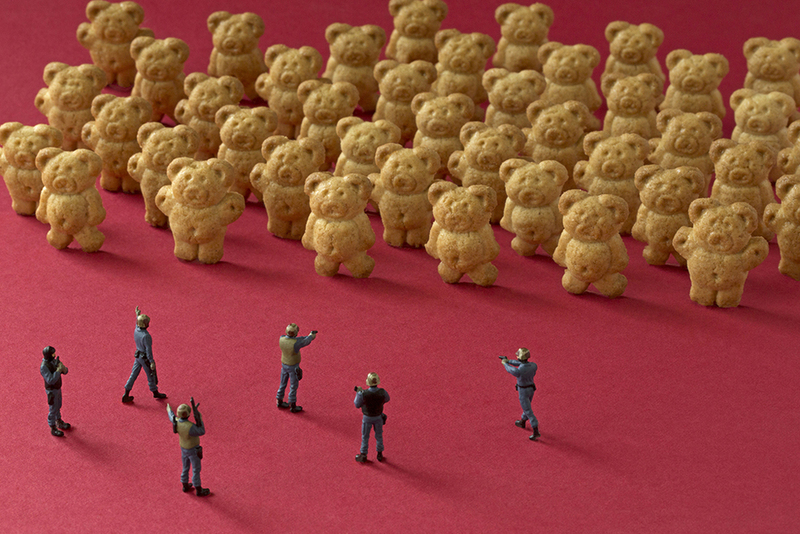 They used hundreds of hand-made figures in rather disturbing and horrific battle scenes. It was somewhat hard to approach (which I think is a good thing and something art can and should do to challenge us) but wonderfully executed. In the time since this work has gone viral, I have become aware of other artists who have been working with similar concepts and even some who have even worked with small figures (and sometimes food). Though I was not aware of these artists at the time I commenced work on this project, it does not surprise me that others are exploring similar ideas as, again, the elements of food and toys are the most common things to many people. The set-ups come from a very natural place. I'll usually start with the food, observing what's in season at the farmers market, considering what I've shot before. Or I think about iconic American foods, like Oreo cookies or Twinkies, and how an image of those things might tap into someone's early memory (or current closet addiction/supermarket guilty pleasure). I also consider how I can populate those images with figures with a context that makes sense. By now I have quite a little community of figures that I use, and I keep adding to the arsenal all the time. So that's a big factor: finding a clever match for what I want to shoot. These images look simple but can be tedious to set-up. I'll often try to do multiple set-ups over a few hours. Some go quickly. Others take longer. I'll work out lighting and depth-of-field. There is a certain corner of my studio that I tend to use for this project. We have a lot of overcast days here in Seattle so it has marvelous, diffused light. I try to use available light as much as possible, though if I'm still working in winter as the evening approaches I'll very rarely set up a couple of off-camera slaves to add light. Sometimes a set-up just doesn't work the way I had hoped and I'll change the orientation of the background and/or the figures. The figures in this work are all hand-painted and their meticulous detail is a big part of why the images work. On occasion I'll re-paint or modify figures to suit my purposes. They’re designed to be glued down so they don't stand on their own. The trick is getting them arranged. A lot of food is soft so I can use a toothpick to make a small hole into which I can insert one of the feet. Other times I use agave nectar or a proprietary putty to get the feet to stand on hard surfaces. Most of the process is enjoyable, from getting the idea, or seeing a food product – that would make a good backdrop – to actually setting it up in my studio and shooting it while I'm rocking out to music. Other than some light and color adjustment, the images are not heavily manipulated with image processing software. The food I use is even totally real. Especially with commercial food photography there is a lot of cheating, for instance, using white glue in place of milk or glass cubes instead of ice. But I don't really need to cheat with the food either. It is not always something you'd want to eat at the end of the shoot. But it is real. The images have a strength and a personality of their own. But they are most often exhibited with captions that lend an extra bit of energy to the concept, and of course, often reinforce the laugh. For instance, one of the more popular images from this series is the man spreading mustard on the hot dog. And the caption reads: “Gary always uses too much mustard. But no one can say so. It’s a union thing.” So you have this image of a food that is often associated with the simplicity of backyard barbecues and Americana, and there is a problem that belies a greater complexity. So it adds an element of surprise and humor that things aren't simply as they appear. That he might actually have a shot at the burger. Hopefully it gives the viewer a laugh at the expectation of events that may have followed. And again, it challenges the veracity of our first impression.